This is our favorite. They have interesting movies, they are careful about what they choose to show: fine european, asian, american, sometimes alternative movies usually in original language with russian subtitles. For example, what they had in the 2000: Henry Fool, American Beauty, Magnolia, Acid House. In the night time they have night non-stop shows (two movies). Decent sound and 11-meter long, not very large, but quite comfortable fancy hall. Cafe in the lobby. This cinema is located in a nice Moscow area, if you go down to the centrum it can be a really fine walk. There are 5 halls in the cinema each called after great cinema men (Rolan, Ptushko, Kurosava, Gaben, Chaplin) - this is the reason why the cinema hall is called "5 stars". The seats in the halls are very comfortable and quite large. When you walk out of the metro station you notice the train station (2 floors, brightlong building), you should cross the big street (Garden Ring) to be opposite to the station. Go into the big street which starts from the underground pass, the cinema hall is in 300 meters. In the same building as the Museum of Cinema (above). They show many different movies every day. There's a big and a small hall, not very comfortable, but nice for seeing a movie. Most of the time they have movies in original language with subtitles. Located in the same building as Museum of Cinema (see below). A cinema in "Penta Renaissance" hotel. Interesting design of the hall, movies always in original language translated in Russian through headphones. Good quality dolby surround sound. Nice, but slightly overpriced restaurants and cafes in the lobby. 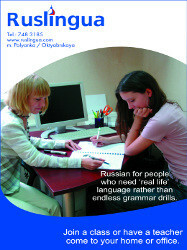 WayToRussia.Netreaders get a special discount! Specializes in old Russian, Soviet, and foreign movies. Sometimes, it is the only place where you can see productions of Soviet filmmakers of 20s or 30s 20th century. Located in the old Stalin's skyscraper (7 sisters). No cafe inside, but a nice chill-out club "Kult" just across the road. Prices: 20-60 R ($0,7 - $2 US). Favorite place of Moscow's intellectuals and students, it's known for the uniqueness of its repertoire. Usually they show either old movies or alternative new ones. Sometimes there are special shows for the whole week: a week of english movies, of finnish movies etc. There are four halls in all. Many movies are shown in the original language. If it's a good movie it's hard to buy ticket, so come there beforehand - maybe one day before. This cinema is closed in August. The interior is nothing fancy, but there are some cafes around near the metro. Attracts kind of bohema and "arty" people. This cinema specializes on the new classics - Almodovar, Jarmush, Kusturitsa, Vudi Allen, Joselliani. There are two halls: one for 200 people and another - for 50. Because of the original repertoire Rolan attracts many people: queues in the evenings and on the weekends are quite often. There's pompous foyer and a bar with good selection of drinks. A cinema for lovers. There's a small hall with a small screen and very comfy chairs: you sit low, as if half-lying, looking up at the screen and in the back rows there are seats for two where you can sit together and watch the movie. While watching the movie, you can call a waiter and he'll bring you a drink (for $$). There are non-stop night shows. There's well-designed expensive bar with a big TV showing movies too (different from those they show in the hall). Movies are shown only in Russian. A strange cinema. Just in the heart of the city it's stayed like it was in the 1970th with no redecoration, similar to the hotel Rossiya, where it's situated. This place is good only because sometimes they have really nice alternative european movies or special events: for example, a week of Japanese movies in Moscow.